And, ultimately, “me” trumps all. Into partaking the nature of God. In this we enter into choreographed freedom. That the “me” is best known. I re-read this hymn all day long yesterday, and last night I found a Youtube recording of it so I could also hear the tune. Click on the title below to listen to the recording. Hope you enjoy as well. He walked through the dark to scatter new light. I chose this picture (taken recently at the dog park early in the morning) because it’s beautiful and because it also gives me a visual of unity. 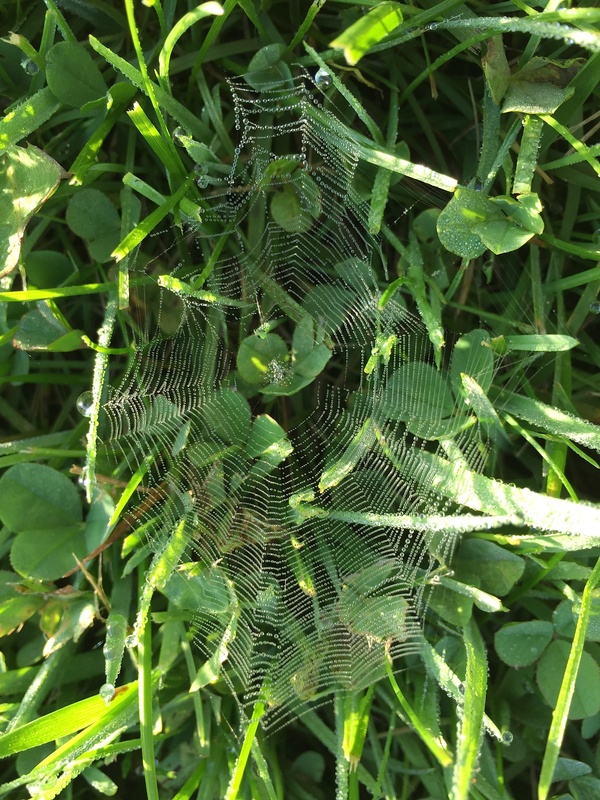 All the lines of the web lead to the center. Not one tries to move off in its own direction. It wasn’t major, simply one of those fairly normal interactions that often happen when families are trying to get out the door in the morning. She wasn’t happy with this. She wasn’t happy with that. She made a face at one thing and groaned at another. And when we got in the car and she made one more slightly snarky comment, I shot back. I regretted it the minute the words left my mouth. Actually, it was one word in particular I regretted… Oh, I thought, that could sting. I wanted to apologize, but that very second, the car door opened, and the rest of the crew tumbled in. I prayed the entire way to church. Lord, give me a chance alone with her to say I’m sorry, to say I was wrong. And, somehow, please, restore this break I created in our relationship. I dropped everyone off at the door and parked, still praying for an opportunity before church began. I couldn’t sit through an entire service with that rift between us. But they were still in a clump when I entered, and I had to check one into children’s church. Then another asked me a question as we walked toward the sanctuary. We were getting closer, closer; our group was straggling into a line. I fell into step next to her. Finally, right outside the doors, it was just the two of us. “I need to talk to you,” I told her, and we stepped aside. I apologized, and then–what grace–she did, too. Who, despite being incredibly magnificent and powerful, so obviously cares about my relationship with my daughter. In the same moment that He dealt with world powers and stars and universal affairs, He also thought it a priority to heal a relationship between two individuals. Amazing! I shook my head at the wonder of it. We sang the “Gloria” next, the beautiful song we sing many Sundays that honors the Father and the Son and then ends with the unity of the three-in-one. As we sang, “Jesus Christ, with the Holy Spirit, in the glory of God the Father,” awe of the Trinity washed over me anew. THIS is why God cares about the harmony not only of the vast universe but also of our families. The Trinity is why God cares about each and every relationship we have. This is why He longs for unity in the Church and peace on earth. Nearly two years ago, our family moved back to West Chicago from Sterling, Kansas. It was not an easy transition for me. Though we lived in Sterling only three years, I felt I belonged in that tiny Kansas town more than I’d belonged anywhere else. I could be myself there, quirks and all. I felt that I fit, that there was a bigger purpose for my individual gifts. Then we moved back to West Chicago—a place we’d already lived—and I felt launched into no-man’s land. I had to re-discover who I was, what I should be doing, and where I fit—all in the bigger context of suburbia with its many, unconnected worlds. I missed the irony at first. How do I show the struggle to belong in this story? I wondered, not realizing I was living it out in my own life. But bit by bit, I started to see it. Then, though, came the feeling that I was the only one going through this. Everybody else has it all figured out, right? We want to be part of something bigger than ourselves. We want to be integral to this bigger something, and we want to belong for simply being who we are, not for our talents or accomplishments. At the same time we have a desire for significance in who we are individually. We want to be seen as important or needed or gifted. We want to be unique and special. These two are perfectly combined in the person of God. Yet God also calls Himself the “I AM.” God is significant—He is significance Himself. He IS unique and special. So our desires—to belong and to be—have holy roots. But when they’re not fulfilled in the Three-In-One who combines them, they grow up twisted. That describes most of us, most of the time. Look at me, we cry. See what I’ve done. See that I’m special. OR we cry, Pick me, pick me. I don’t want to be left behind. I want to be “in,” not “out.” I want to belong. And deep down, we really want both. In the great “I AM,” we can be. In the great “WE ARE ONE,” we can belong. We are in the process of converting the 1970s cowboy-themed basement family room into Dave’s and my bedroom (with office space for me!). 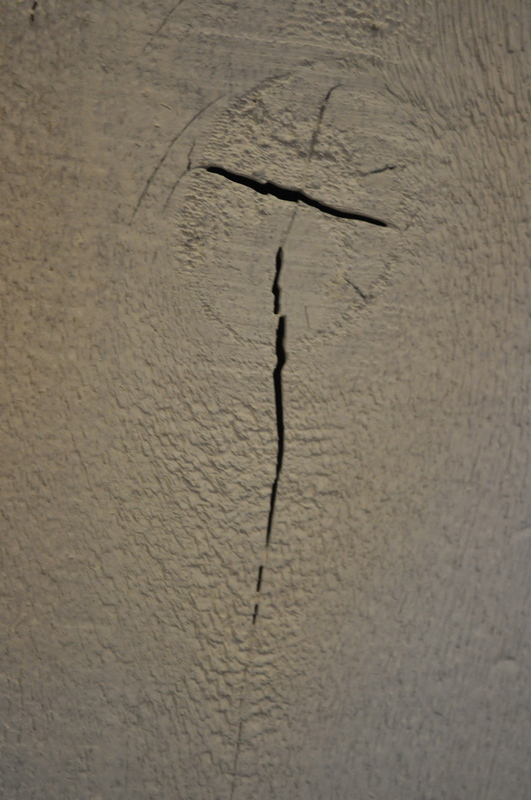 When Dave painted all the rough wood, this crack– in the shape of a cross–emerged. God allowed His firstborn to die—so that we might live. I am sitting across the table from my firstborn right now. She is eating her cereal; I am drinking my coffee. We have just had a conversation about how great I think she is, about how glad I am to be her mom (she really is a pretty cool kid). Can you imagine the gladness that enveloped the Trinity in that moment? The Spirit-Dove descending, the great voice shaking the sky, the Son letting the blessing of love and favor fall upon Him! My heart is full as I write these words. My God knew full well what was going to happen to His Beloved when He spoke that blessing. But for the sake of me and my firstborn and all my other children—and you and your beloveds, too—He suffered, as Father and as Sacrifice—that we might be set free to LIVE in HIM.